The majority of the world's remaining mountain gorillas live in Africa, in the Virunga mountain region between the Democratic Republic of Congo and Rwanda borders. This includes both the Bwindi Impenetrable National Park and Mgahinga Gorilla Park in Uganda. Although humans have encroached on the mountain gorilla's natural habitat, conservation efforts are in effect to protect this gentle giant. It was a surprise for German mountaineers in 1902 to find gorillas in this high, cool climate, the complete opposite of the West African environment where lowland gorillas were known to live. This mountainous region hosts altitudes of 3,800 to 13,400 feet above sea level. Though rain can fall all year long, it is heaviest from March through May and from mid-September through mid-December. Daytime temperatures reach roughly 50 to 73 degrees Fahrenheit. The forests where mountain gorillas live provide a plethora of tree cover, creating a dark environment. Here an adult gorilla will feast on 75 pounds of leaves, shoots, stems and small amounts of wood, roots, flowers and fruit each day. Occasionally they will snack on larvae, snails and ants. The forest also provides the mountain gorilla with twigs and leaves to make nests, as the animals will often move from one location to another. The 1988 film "Gorillas in the Mist" highlighted the story of Dian Fossey and her attempts to protect the mountain gorillas of this region. In spite of its illegality, poachers have long hunted the mountain gorilla to sell body parts and babies on the black market. War and the demand for agriculture has also pushed humans to take over areas where the mountain gorillas live. Though Fossey did not approve of creating a tourist destination out of the mountains, it is not without some benefit to the gorillas. The Uganda Wildlife Authority has been able to educate the local community on promoting a thriving gorilla habitat, rather than encroaching on the environment. This in turn allows for a thriving local economy as tourists visit to see the gorillas. With 97 percent similar DNA, the mountain gorillas are susceptible to human disease, though they possess a lower resistance. 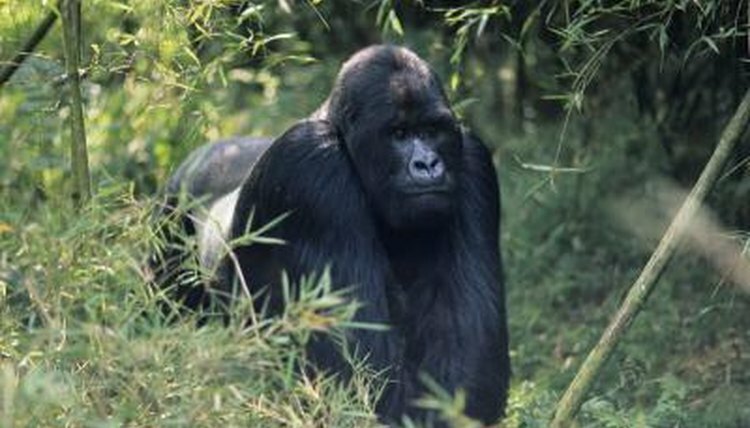 The UWA has implemented certain rules to prevent the transfer of disease from humans to gorillas. With these measures in place, the mountain gorilla population has a chance to come back from the brink.